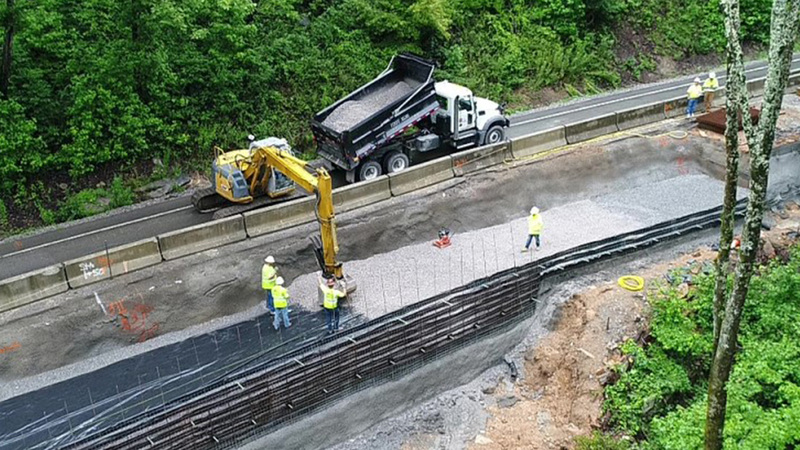 Spring City, TN – TDOT personnel and contract crews are nearing completion of a stabilization project on State Route 68 near log mile 5 in Rhea County. To expedite completion of the project, it will be necessary to completely close the road for a two-day period beginning on Monday, July 16, 2018 at 5:00 a.m. CDT. This will allow crews full access to the work site to complete rebuilding the outside lane, including backfilling the area with new material, paving, putting down pavement markings and installing guardrail. By closing the road for two days, it will save nearly a week’s worth of time on the project and the roadway can be fully reopened to two lanes. This work is weather permitting. If inclement weather or unforeseen circumstances prohibit this work from occurring, it will be rescheduled to take place at a later date. SR-68 was closed on April 24, 2018 because the outside lane became unstable and slid down the slope. Repair work began on April 26, 2018 using TDOT forces and crews from GeoStabilization International, LLC (GSI) under a statewide on-call maintenance contract for soil nailing and slope stabilization. On May 12, 2018 stabilization work had progressed enough that the roadway was opened to one lane and controlled with a temporary signal. As the work continued on the stabilization project, the contractor and TDOT crews had to compete with traffic for use of the one open lane, which both slowed progress on the project and lengthened the time that drivers had to wait in line to get through the work zone. When material was delivered and unloaded for the project, the wait time for drivers to travel through the area could be as long as 30 minutes. By completely closing the road for two days, it will speed up completion of the project and allow the road to be fully reopened to two lanes nearly a week sooner than if the road is kept open to one lane during the remainder of the work. Message boards will be used to notify the public of the closure, and detours will be posted. Emergency personnel in the area have also been notified of this closure.